2:00 Joy calls out Summer’s inability to be emotionally vulnerable in public. 7:40ish Summer introduces today’s topic and why its important oh and of course—the caveats. 11:20ish Summer’s food delivery arrives and we don’t even bother to cut it out. Joy is worried about whether or not Summer ordered a case of beans. 12:15ish Who determines what “justice” is and what do these theories fail to produce? 19:00ish These theories ASSUME a lot about another person—and often unfairly. 22:00ish In actual cases of injustice, we are not asking that you just “forget about it.” The Bible has a lot to say about hurt, injustice, forgiveness, and unity in the Church. 29:00ish You give people NOTHING when you orient them towards the sins of others. 31:00ish Can you deal with sin in the church the same way that you approach sin in the church? 33:00ish Intersectionality—literally debunked in one verse. 37:00ish Yea. We talk about police injustice. 44:00ish False equivalence between speaking out against one thing and “not paying enough attention” to another. 47:00ish God’s solution for injustice. 51:45 Whoa, unity in Christ is pretty serious and here’s how! 55:00 What to do if you’re experiencing injustice. 58:00 Why we did these episodes and why it was difficult. I’m not sure if this is a ‘thinking thinking’ comment, but…. I just literally love listening to you two! I’m so glad I found your podcast! Thank you for doing this episode. Thank you for publishing this, even if it scared you. I am finishing my first semester at a very liberal university, where ALL of my professors have found ways to fit their feminist beliefs into course content. It’s been so difficult to sift through all of the lies I’m being taught by authoritative voices. (Like, I’m supposed to come here and learn, but I’m also having to actively NOT learn a lot at the same time.) One of these lies that I began to believe was about intersectionality. 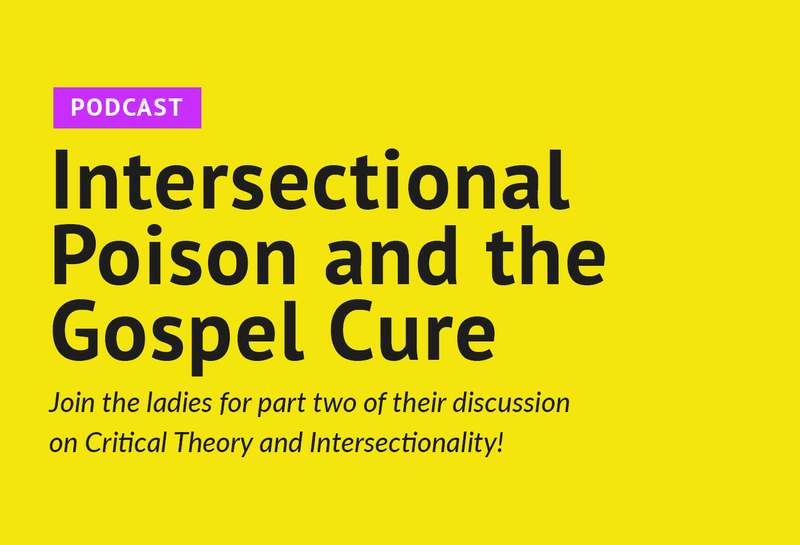 After listening to this, I can see how foolish and unbiblical intersectionality (and the feminist movement itself) is. And I have found a new thing that I can have a more gospel-centered perspective on. So, thank you. Praise God for the work He is doing through you guys here! I hadn’t heard this word before but since listening to these podcasts can see it all around me. Today, it’s more clear than ever before after Oprah’s much raved about speech at the Golden Globes last night. Thanks for the warning and being an anchor of truth among the deceitful words of our culture. I am appalled that you would ‘reject’ intersectionality. There is nothing to reject. It is simply recognizing that there are different experiences and identities which culminate the overall individual. I am a Black, female, immigrant, college-educated, able-bodied, heterosexual Christian. Each of these characteristics dictate that my experience with society will be very different from someone else who is different. Therefore we should be mindful of this reality. I wish to believe that you are well-meaning, but you have missed the mark on the concept on intersectionality. It does not exist to create barriers between people. Rather, it recognizes how we are diverse (which I’m sure God intended) and how we should strive for more inclusive spaces. Intersectionality is not damaging. Your ‘rejection’ of it is.